Ive had this problem some time now. After a while when my PC is started the pointer just gets stuck in some random ugly skin. And i can't get it back to it's "original" state. Only on PC restart. The pointer works, and i can move it and such. But sometimes it gets a skin that looks like a dotted line. I hope you'll know the problem.. I can't find any solutions or anything..
Re: [Pointer] My mouse pointer is stuck in another skin. I have had that happen on my own system randomly and only when I have multiple monitors hooked up. When I move the mouse from one screen to another the mouse pointer gets messed up and looks like a dotted line, but if you look close it is actually the mouse pointer repeated a ton of times and smaller. But when I move the mouse point back to the other screen and back again windows corrects it and it looks normal again. Never found out what is causing it but I do know it is windows that is doing it. Moving it over something that normally changes the mouse to a different icon, such as resizing a window will sometimes do the trick as well. Yeah just noticed it day too.. I have my oroginal 24" screen. But i also gt my system hooked up to my TV so i can watch movies and such from my PC. But i nearly always have the TV off. I also have to change it back to play a game But still have a dotted line. Any possible way for you to take a picture of the mouse pointer when it does it? Might have to do it with your phone since the windows screen shot normally doesnt have the mouse pointer. I want to see if the mouse pointer is the same thing that I get every now and then. I hope it's a good pic for you. Yeah, that is the same thing mine would do. It is like the icon for the pointer gets corrupt in memory and simply has to be reloaded. It happens very randomly and not very often. On your system is there anything you do before it changes? For me it was when I switched between monitors quickly and with certain programs that changed the mouse pointer when you mouse over them. Can you think of a common factor on your system that is done that might trigger it? ONLY when i move my pointer to the other screen. Same thing here, but if it I move it back to the other screen the mouse is normal and then I go and place the mouse over other windows and such to get the icon to change, then when I bring it back to the other monitor the mouse will be normal. I have to do it a few times but it works when it happens. The only way to fix it is to restart and hope my mouse don't go over to the other screen. But if i add pointer trails the mouse wont show in-games..
Do me a fav, I will be on my computer for the next 3 hours. Get teamviewer ready and when the mouse point changes again email me and I will connect and see if it is the same thing as mine and if I can get it to fix it self without you having to restart. My email is shane at pcwintech.com, shot me an email. I have been wanting to find out why it happens since it happens so randomly. Updating my video card drivers did seem to make it happen less often and I havent had it happen in a while now, I know that starting with vista and 7 that windows uses the gpu to draw the desktop and mouse, so that might be a common factor. I wouldnt mind trying to trace down the cause. The problem was the ATI drivers, has been a problem since some time back. 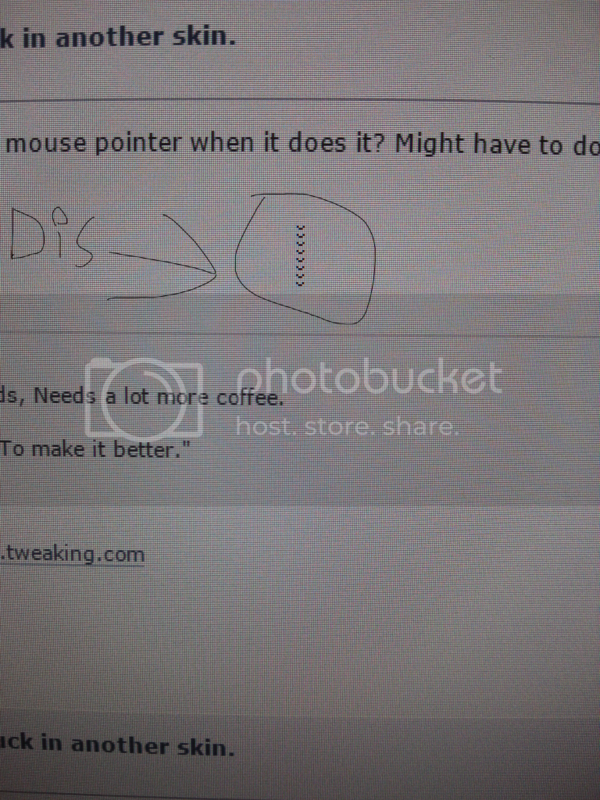 with dual monitors that the mouse pointer get stuck in some wierd dotted line. But AMD is aware of the problem and they fixed it in the latest 14.9.2 Beta driver!